While food trucks continue to proliferate across the country, New Yorkers are already enjoying the latest culinary trend: food halls. At these new culinary destinations, foodies can eat, buy ingredients, and learn how to prepare and cook them all in one place. 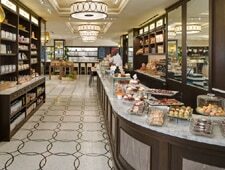 Conceived by Todd English, The Plaza Food Hall features a European-style market inside The Plaza Hotel offering an extensive array of dishes. The 5,400 square-foot, 80-seat space offers dine-in and take-away options from more than eight culinary stations, as well as fresh flowers, a range of international specialty foods, cookware and home goods like coffee, tea, jams, spices and sauces. The open kitchens throughout the space allow for interactive events including cooking demonstrations with the star of PBS’s Food Trip with Todd English and other visiting chefs as well as wine tastings. Currently, seafood can be found at “The Ocean Grill & Oyster Bar,” Asian-American cuisine at the “Dumpling Bar” and sushi bar, while “The Grill” offers burgers, salads, and more. There’s also a bakery, a cheese and charcuterie counter, a wine bar with tapas, and a stone hearth oven for pizza. Visitors can buy a Food Hall picnic basket and enjoy it in Central Park. The moderate prices make the shopping and eating experience easy to digest. The Plaza Food Hall, 1 West 58th St. New York, NY. www.theplazafoodhall.com (212) 986-9260. Hours: 7:00am to 10:00pm Sunday-Thursday, 7:00am to 11:00pm Friday and Saturday. Check back tomorrow for Part 2 of our Introduction to Food Halls, featuring Chef Mario Batali‘s Eataly. Keep up with the NY dining scene with New York Restaurant News, Reviews, Culinary Events and Wine Dinners.